Newcastle Upon Tyne based artists Prefab have just relesed a new print. PREFAB's imagery always has a British slant, a satire on modern british living, rebelling against the establishment, celebrating/mourning the passing of our great institutions, poking fun of the characters they come across in our streets, each print telling a story of modern Britain. 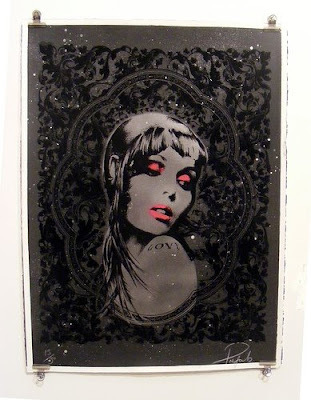 The new ltd. edition screenprint pictured above is titled "Skingirl". The print is a ltd. edition/50 - 4 layer spraypaint stencil with high-gloss screenprint finish. There are 5 colours available, (chrome silver, chrome gold, lime, lilac, and hot pink).The print is priced at £150, please contact info@prefab77.co.uk for availability. Each colour is available x10, making up the edition of 50.